Anna Hibiscus’ Song. Atinuke (2011). Illustrated by Tobia, Lauren. London: Kane/Miller. ISBN: 9781610670401. Set in Nigeria. Anna Hibicus is so filled with happiness that she feels like she might float away. And the more she talks to her mother and father and grandfather and grandmother and aunties and cousins about it, the more her happiness grows. 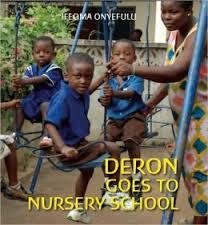 Deron Goes to Nursery School. Onyefulu, Ifeoma (2009). Photographs. London: Frances Lincoln. ISBN: 9781845078645. Set in Green, Ghana. Deron has a busy first day of nursery school near his home in Ghana. Grandma Comes to Stay. Onyefulu, Ifeoma (2009). Photographs. London: Frances Lincoln. ISBN: 9781845078652. Set in Green, Ghana. A young girl works hard to help get ready for a visit from Grandma and she is rewarded by special gifts only a grandmother can give. 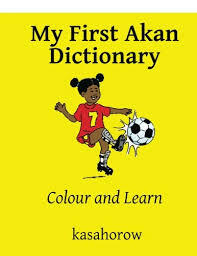 My First Akan Dictionary. Kasahorow (2013). Lexington, KY: CreateSpace. ISBN: 9781480106598. Ghana. Introduces 50 everyday objects in Akan and English. 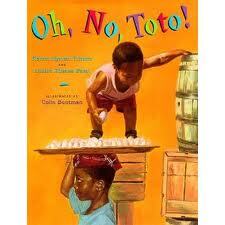 Oh, No, Toto!. Tchana, Katrin Hyman & Pami, Luoise Tchana (1997). Illustrated by Bootman, Colin. NY: Scholastic. ISBN: 9780590465854. Set in Cameroon. Little Toto loves to eat, and when he goes with his grandmother to the marketplace he eats everything in sight, leaving chaos in his wake. Includes a glossary of Cameroonian foods. 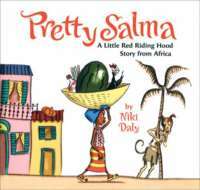 Pretty Salma: A Little Red Riding Hood Story from Africa. Daly, Niki (2006). NY: Clarion. ISBN: 978-0618723454. Set in Ghana. In this version of “Little Red Riding Hood,” set in Ghana, a young girl fails to heed Granny’s warning about the dangers of talking to strangers on her way to the market and is tricked by Mr. Dog. The Hatseller and the Monkeys. Diakité, Baba Wagué (1999). NY: Scholastic. ISBN: 9780590960717. Set in Mali. An African version of the familiar story of a man who sets off to sell his hats, only to have them stolen by a treeful of mischievous monkeys. Welcome Dede! 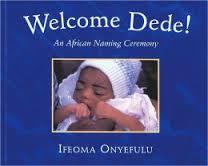 An African Naming Ceremony. Onyefulu, Ifeoma (2003). London: Frances Lincoln. ISBN: 9781845073114. Set in Ghana. Amarlai, a boy from Ghana, helps his family prepare for his new baby cousin’s naming ceremony. We’re Going On a Lion Hunt. 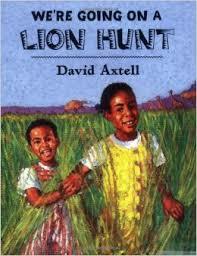 Axtell, David (2007). NY: Henry Holt. ISBN: 9780805082197. Set in the African savanna. Two girls set out bravely in search of a lion, going through long grass, a swamp, and a cave before they find what they’re looking for.